Many narrow ravines cut all or part of the way across the Waterpocket Fold in Capitol Reef National Park - some are blocked at intervals by chokestones and dryfalls so are quite difficult to explore (such as Burro Wash, Cottonwood Wash or Sheets Gulch), but two are much easier to follow and have a recognized trail all the way through. These are Grand Wash, 3.5 miles by road south of the national park visitor center, and Capitol Gorge, 7 miles further south along the same scenic drive, which is paved for most of the way though the last 2.5 miles is unpaved, winding its way along the deep but relatively wide upper part of the gorge to the trailhead, beyond which the canyon narrows significantly. 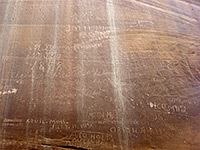 In the course of just one mile, the Capitol Gorge Trail passes a petroglyph panel, several hundred historic signatures (the Pioneer Register), a small natural arch and a sequence of water-filled potholes (the Tanks), and a narrow, rocky side canyon that also has potholes, and dryfalls. Together with Capitol Gorge itself - which although never particularly enclosed, and not a slot canyon, is quite impressive, with mostly sheer walls of multicolored Navajo sandstone - the hike encounters a variety of interesting features, and is very popular; a good choice for families and children. 13 views of the Capitol Gorge Trail. 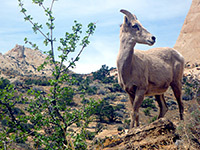 From the good sized parking area at the end of the unpaved section of the scenic drive, the Capitol Gorge Trail leads through a picnic enclosure and over bushy sandbanks on the north side of the gorge, soon reaching a panel of Fremont Indian petroglyphs. The etchings are quite plentiful, and include hands, spirals and other abstract shapes, and three large ghost-like effigies, but all are rather faded and indistinct. The path then joins the streambed and follows it the rest of the way, as the drainage constricts, and the water (when flowing) extends from wall to wall. The gorge is sheer-sided, except where the cliffs are interrupted by short, steeply-sloping side canyons, and is about 30 feet across at floor level, so plenty wide enough for the vehicles that used to drive through early in the 20th century, when the gorge was part of the main route between Notom and the west. The rocks are Navajo sandstone, generally dull brown/yellow/grey in color, but enlivened by streaks of desert varnish. After a few bends, the Pioneer Register (also on the north side) is a large group of old signatures carved into the rocks, extending for several hundred feet, with some names 20 feet or more above the streambed. Most range from the late 19th century to around 1930, and include several famous settlers such as Eph Hanks and Cass Hite. NPS notices warn against modern visitors adding to the signatures, with threat of a $250 fine. The register is located in the most confined part of the canyon, beneath the highest point of the reef; beyond here, a few more tributary ravines join as the cliffs gradually recede. One short drainage on the north side contains a series of water-retaining potholes - the Tanks, one spanned by a small natural bridge; a spur trail climbs about 100 feet up to a viewpoint. 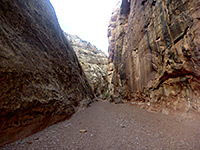 Opposite is the junction with Waterpocket Canyon, which has more, widely separated potholes, and although the lower end is blocked by a dryfall this can be passed by climbing up the right hand side, giving access to another half mile of rocky passages, before a higher, less easily overcome fall. 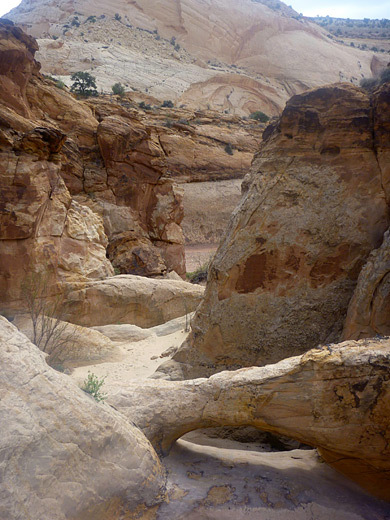 Further east, the main gorge soon opens out at the edge of the reef, where the smooth, whitish Navajo sandstone is replaced by the more uneven, yellow-brown Carmel Formation.